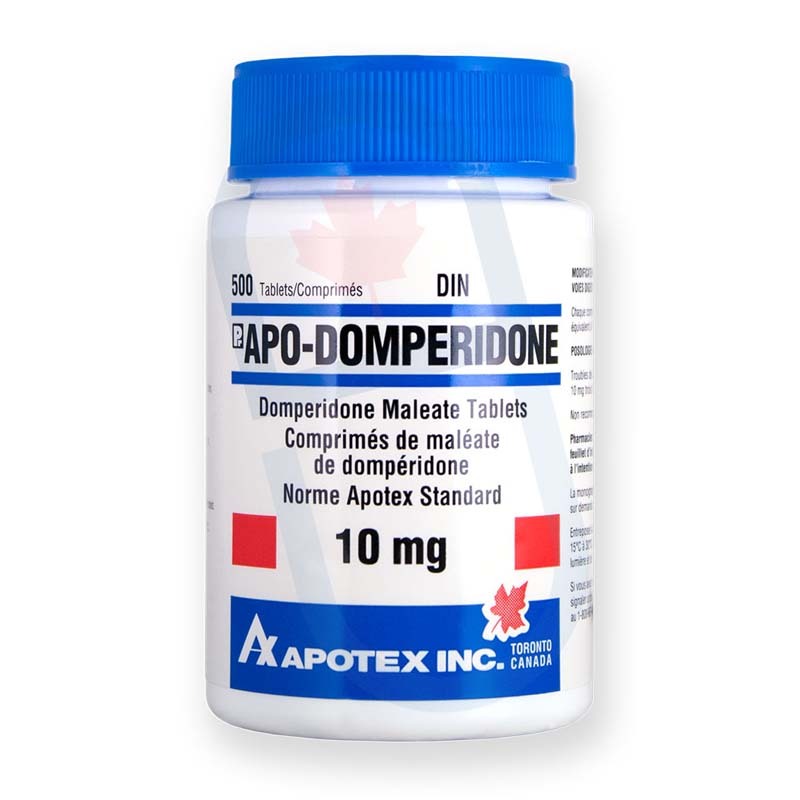 Note: Canadian manufacturers ship Domperidone in 500 tablet sizes. Our licensed pharmacists break down these sizes into smaller bottles for orders of 100 tablets. Where can I order Domperidone online? You can order Domperidone 10 mg online from Canada. YouDrugstore is an online Canadian pharmacy, which means when you buy Domperidone 10 mg from us you pay the same price that Canadians pay. Purchase Domperidone 10 mg today from YouDrugstore and find relief from your ongoing stomach upset. Domperidone is the generic version of motilium, molax, and brulium. We just need you to register on our website and send us your prescription. You can even have your doctor fax us your prescription directly. Once we receive all the necessary information our team of highly skilled, professional health care specialists will review your order. When you purchase Domperidone 10 mg from YouDrugstore we ship it right do your door for an affordable shipping cost. Pay just $15 for shipping on all orders under $100. Order Domperidone 10 mg today from YouDrugstore. What does Domperidone 10 mg do? Your doctor has prescribed Domperidone 10 mg because of your ongoing or severe upset stomach, vomiting, nausea, and diarrhea. It also helps treat gastroenteritis. You feel nauseous when your nervous system tells your brain that something uncomfortable is happening in your stomach. Domperidone 10 mg stops your nervous system from giving those signals to your brain. This is what helps alleviate the feeling of nausea for you when you take Domperidone 10 mg. Domperidone 10 mg also increases the activity of your upper gastrointestinal tract, which helps process and remove any material in your stomach, including what may be causing the upset. Domperidone has also been used to help increase lactation in women. It does this by signaling your brain to release more prolactin, a hormone that facilitates milk production. 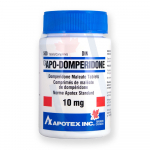 As a member of the Canadian International Pharmacy Association (CIPA), YouDrugstore carries Domperidone 10 mg for the purpose of treating gastrointestinal issues only, such as gastroenteritis. When should I take Domperidone 10 mg? Typically, you should take 1 or 2 Domperidone tablets about 3 or 4 times a day. You should take them right before a meal. You should also not chew or break the tablets, and you should consume enough liquid to ensure that the tablets make it to your stomach. Do not take more than 80 mg of Domperidone a day. If you happen to miss a dose, simply take it as soon as you remember unless it is close to your next dose. In that case, simply wait for your next dose and carry on as normal. Do not double dose with Domperidone 10 mg. Finally, always take Domperidone 10 mg exactly as your doctor tells you to. If you have any questions, ask your doctor. Why is Domperidone prescribed to treat gastroenteritis, nausea, vomiting, and diarrhea? Domperidone 10 mg is an antiemetic. Antiemetics are among some of the most effective drugs in treating vomiting and nausea. Your doctor has prescribed Domperidone 10 mg because it is the generic version of motilium, brulium, and molax. It is the main ingredient in these medications. Who might receive a prescription for Domperidone 10 mg from their doctor? Your doctor has prescribed Domperidone 10 mg for you to treat gastrointestinal problems. You may be suffering from gastroenteritis. Gastroenteritis is also known as the stomach flu. Symptoms of the stomach flu include mostly vomiting and diarrhea. General discomfort with the stomach is also common with stomach flu. However, Domperidone 10 mg should not be taken by anyone under 75 pounds, especially children who are under this weight. If you have any questions or concerns, speak to your doctor. How can I learn more about Domperidone?